Description: Muilla maritima is a perennial growing from a short, vertical, swollen underground plant stem that produces an erect flowering stem. The flowering stem bears an umbrella-shaped array of many flowers on pedicels up to 5 cm long. 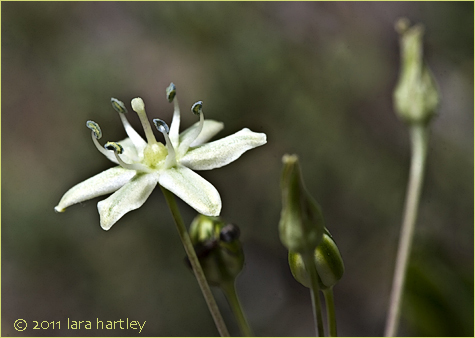 Each flower has six tepals which are green-tinged white in color with brownish midribs and no more than 6 millimeters in length. At the center of the flower are six erect stamens with blue, green, or purplish anthers. Leaf: The onionlike leaves at the base of the stem may be 60 cm long. Notes: Muilla maritima, a monocot, is a perennial herb that is native to California and is also found outside of California, but is confined to western North America. The generic name Muilla is derived from the generic name Allium spelled backwards. Horticulture: Given excellent drainage (modification of compacted or other water-holding soils may be necessary), absence of frequent summer water (distance from water-loving plants), and full or nearly full sun (tolerates summer afternoon sun), grows in zones 3, 7, and 14. Difficult; needs special care in all zones; has complex requirements. This photo was taken on May 30, 2009 in the San Gabriel Mtns.